Even President Donald Trump's own State Department officials have warned him against his moves to deport more than 46,000 Haitians , 57,000 Hondurans and 195,000 Salvadorans who enjoyed Temporary Protection Status, or TPS, in the United States. Such a move will destabilize the entire region but will Trump listen? This is according to State Department cables first disclosed by The Washington Post this week, the Miami Herald reports. Thousands of Haitian families in Haiti depend remittances - money transfers - from that family member in the United States with TPS. For president Trump stick with his decision to send these people home all of a sudden, this will really destabilize the country. A destabilized Central America and Haiti will only produce more illegal immigration, more drug trafficking and greater violence in the region, the Miami Herald reports. « TPS for Haitians - Did the Trump govt lie about the situation in Haiti to send TPS holders back? He can send them home. Haiti is an independent nation who can invite the nations from the Middle East to come into Haiti and create job opportunities for Haitians Perhaps build another airstrip for businesses. There's a lot of potential in Haiti for investors and a workforce that really knows what it means to Work hard. 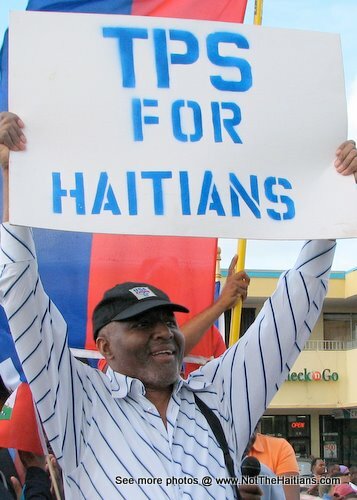 Haitians want jobs not charity. They are proud people and if Trump does not respect their contributions to our society than other nations can take advantage of their geographic location., 600 miles off the coast of Florida.